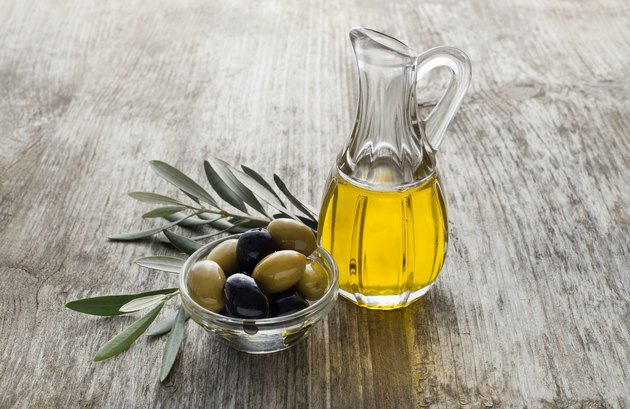 Olive oil is a common home remedy for removing earwax, or cerumen. Earwax is normally present in the ear, acting to protect your inner ear from bacteria or irritating substances such as dust or debris. It also lines the ear membranes, protecting your ear from water-causing infections. But too much earwax can plug the ear, interfere with hearing and cause pain and discomfort -- and using drops of olive oil or other substances to soften this wax can be an effective home remedy. The tiny hairs or cilia in the outer ear, along with your normal jaw movements, guide earwax slowly towards your ear opening as it finds its way out of your ear. Individuals who wear hearing aids, frequent earbud-wearers, or people who have small ear canals or excess cilia are more likely to suffer from cerumen impaction -- the accumulation of earwax which hardens and plugs the ear canal. According to American Academy of Otolaryngology-Head and Neck Surgery Foundation (AAO-HNSF), cerumen impaction usually responds well to drops of oil, glycerin, commercial drops or hydrogen peroxide. Once softened, the earwax typically breaks down into smaller pieces, often slipping to the outside edge of your ear canal where you can easily and safely wipe it with a tissue or soft cloth. Drops are recommended for small to moderate amounts of wax -- larger amounts may require irrigation or manual removal. Research has tried to determine, so far not too successfully, which type of ear drop is the most effective on wax. A test tube study, published in the July 2007 issue of "British Journal of Nursing," assessed the ability of olive oil, sodium bicarbonate, urea-hydrogen peroxide and distilled water to disintegrate earwax. Interestingly, distilled water -- the control -- was most effective, and olive oil failed to break down the earwax even after 24 hours. However, a January 2009 report published in "Cochrane Database of Systematic Reviews" assessed research which compared the effectiveness of several ear softening agents, including olive oil, and found that while using ear drops was better than no treatment, the research did not provide enough evidence to recommend one type of ear drop over another. Although there are questions about the effectiveness of any specific ear drops, olive oil -- as long as it's the same or cooler than body temperature -- is not a harmful treatment. Start by placing room temperature olive oil into an ear dropper. Next, put a few drops of olive oil in the affected ear twice daily for 3 to 4 days, and lay on your side for several minutes to allow the oil to penetrate the wax more deeply. After your last planned treatment, and if necessary to get the wax out, use a bulb syringe to gently spray warm water into the ear to encourage the lubricated wax to fall from the ear. Earwax is a helpful substance, and according to the AAO-HNSF, earwax doesn't need to be removed unless your ear is compacted. Signs of earwax blockage include ringing in your ear, ear pain, a sensation of fullness in your ear and partial or complete loss of hearing. If home treatment doesn't alleviate your symptoms, contact your doctor for advice. Avoid the use of cotton-tipped swabs to clean your ears, as these may push earwax into your ear canal and make your impaction worse. Also avoid using any tools to manually clean out your ears, as this may lead to injury. Ear candles are thought to be ineffective, and water jet devices pose the risk of ear injury and are not recommended. Talk to your doctor if you need advice on treating your cerumen impaction. If you suspect you have an ear infection or a perforated eardrum -- characterized by sharp pain and sometimes drainage or dizziness -- see your doctor. British Journal of Nursing: Back to Basics: Finding an Optimal Cerumenolytic (Earwax Solvent).